This probably shouldn't come as a huge surprise, but apparently the Taliban is using fake Facebook profiles to spy on Australian troops. According to a review of social media and defense by the Australian government, an "overt reliance" on privacy settings has led to a "false sense of security" among personnel. In other words—just because you're a Facebook privacy ninja doesn't mean you should go around posting military secrets on the Internet. 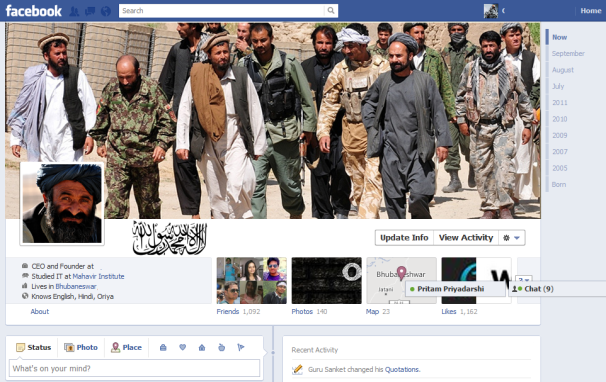 Here's how it works: the tech-savvy Taliban is creating fake Facebook profiles using pictures of attractive women. They're then using these fake profiles to befriend Australian soldiers, and are gathering information based on those soldiers' Facebook updates. A big problem, of course, is Facebook's geo-tagging function, which logs the location from which posts or photos are uploaded. If a soldier posts something to Facebook while they're in the field, this pretty much gives away their location. According to News.com.au, three Australian soldiers were murdered inside their base this month, allegedly by an Afghan Army trainee. According to the review of social media and defense, many soldiers did not realize that people using fake profiles can capture information and movements. "Few consider the possibilities of data mining and how patterns of behavior can be identified over time," the review states. The review surveyed 1577 Australian Department of Defence members on their social media practices and knowledge (or lack thereof) of associated risks. Fifty-eight percent of Defence staff reportedly had no social media training. The Australian Department of Defence is currently working on new social media guidelines, which will be released by Christmas. You may not be a member of the Australian military, but that doesn't mean you should go around friending just anybody on Facebook. Fake Facebook friends and profiles have been around since the beginning of Facebook, and may be anyone from federal agents to spies to companies looking for buzz. - Add as little personal information as possible to your profile. Needless to say, your address, phone number, and date of birth (at the very least, birth year) should not be publicly available or even available to "friends only" on your profile. - Understand how social engineers can use different pieces of information on the Internet to gather intel about you. For example, if you put your birth day and month on your Facebook profile, and you put your high school graduation year on your LinkedIn profile, a savvy social engineer will be able to put two and two together. Therefore, limit personal information as much as possible. - If you're on vacation (or in a secret military location), don't post about it until after you get back (or to a safe, non-secret military location). Posting pictures and updates while you're thousands of miles away from your home advertises that you're…thousands of miles away from your home. - Monitor what your friends say to you and about you on Facebook. In your Privacy settings, it's a good idea to turn on the "review posts" feature, which lets you approve (or disapprove) posts your friends want to tag you in before they automatically appear on your timeline. To turn on this feature, go to Privacy > Timeline and Tagging > Review posts friends tag you in before they appear on your timeline, and turn it "On." - Be careful about what your photos say. Many smartphones automatically geo-tag photos, so it's a good idea to turn this off, if possible. To turn off geo-tagging on an iPhone, go to Settings > Location Services > Camera, and turn the Location Services "Off" for the camera. To turn of geo-tagging on an Android phone, open up your camera, go to Camera settings > Store location, and make sure this is turned "Off." As I said earlier, the easiest way to avoid this type of privacy mishap is to only friend people you actually know in real life. Still, it's a good idea to take these precautions. After all, you never know which of your real-life Facebook friends may have left their account open on a public computer somewhere.